Home / Adobe InDesign / Adobe InDesign: Where are the Frame Fitting Buttons? Adobe InDesign: Where are the Frame Fitting Buttons? This question is coming up over and over again. Turns out a lot of people rely on the Frame Fitting buttons to control the size and position of their images, and in some cases, they have gone missing after the InDesign CC 2015.4 update and this continues in the later versions. What happened? 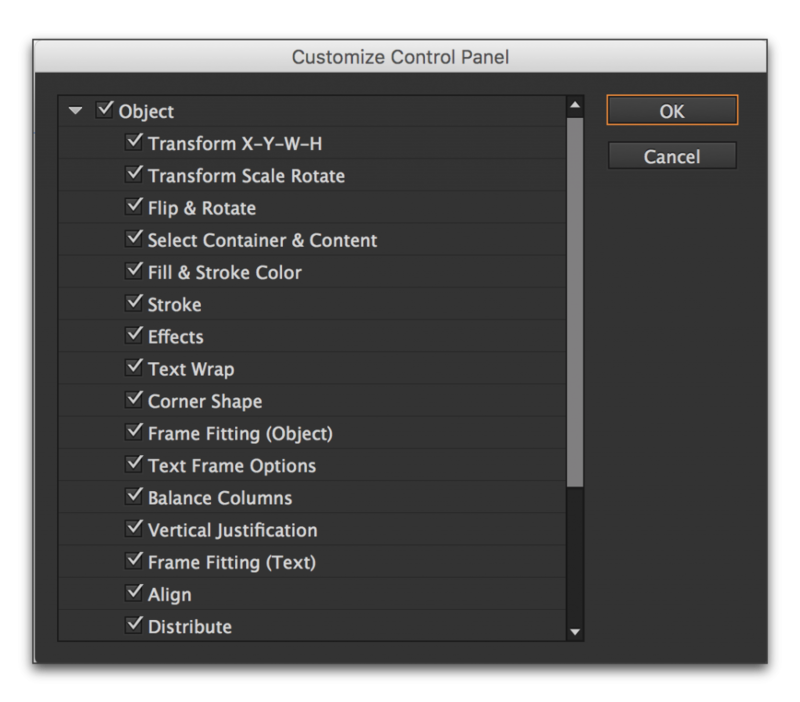 Take a look at the older InDesign Control Panel, directly below (Figure 1). The frame fitting buttons are outlined in orange. Compare that to the CC 2015.4 Control panel (Figure 2). The frame fitting buttons have moved significantly to the right of their old position. As HiDPI and Retina displays become more common, it’s getting harder to see the little buttons, so Adobe increased the size with the last release. That’s great news if you have a HiDPI or Retina display. It’s not so good if you are still working on an older, narrower, lower-resolution display. The buttons on the far right no longer fit and they fall off the right edge. Note. Adobe slightly updated the Control Panel in InDesign CC 2017 with the addition of a gear button on the far right to access the Customize menu. (Figure 3). Use this gear to customize the icon display. Figure 1. The Control Panel prior to InDesign CC 2015.4 using smaller icons. Figure 2. The Control panel in 2015.4, using the new larger icons. Figure 3. The Control Panel in InDesign CC 2017. Note the new gear icon to access the Customize menu on the far right. So what do you do? You could a.) run out and buy a brand new high-resolution display or b.) just hide some of the buttons you don’t use very often. To customize the Control panel, click the menu on the far right side (outlined in orange on Figure 2 and Figure 3). On InDesign CC 2015, you will need to click Customize from the menu as shown in Figure 4. 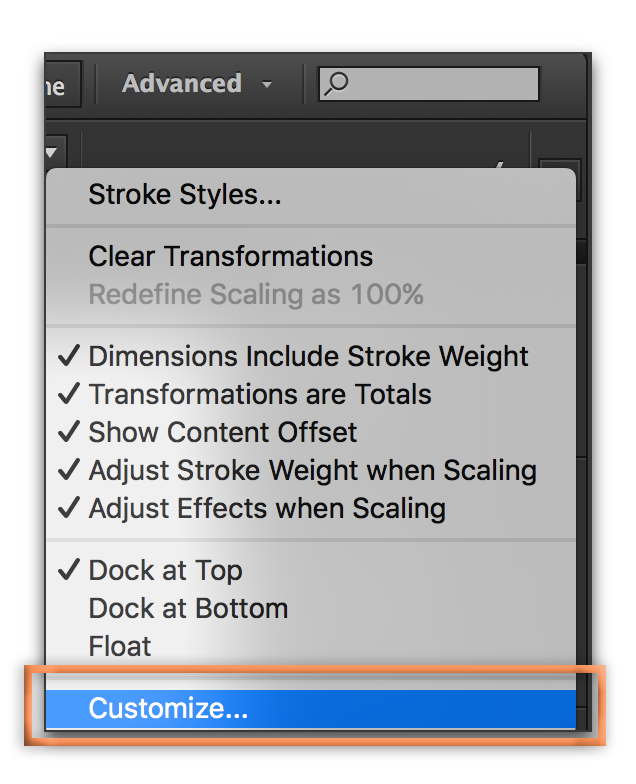 In InDesign CC 2017, you will go directly to Figure 5. Figure 4. InDesign CC 2015. Open the Object category, and start unchecking the buttons that you don’t use very often. Leave the Frame Fitting buttons on, of course! Figure 5. The Customize Control panel dialog box. Remove additional checkmarks in front of the frame fitting commands until they do fit.